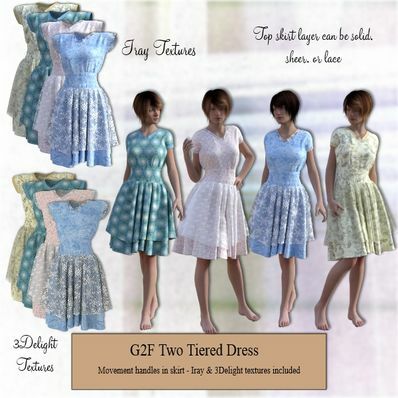 A Two Tiered Dress for Genesis 2 Female for use in Daz Studio 4.8. Thank you very much. These are wonderful! Much appreciated. Thank you so much your items look amazing can hardly wait to try them out.. Your work is always beautiful, thank you so much for sharing!!! I love seeing the improved detail on each new creation! Your work is amazing! Thank you very much for sharing all this wonderful stuff. Absolutely awe inspiring. Lovely textures , thank you! The textures are so perfect! Love the modesty and how realistic this dress is. Thank you so much! Thanks Wendy. These are gorgeous and thanks for creating the 2 types of textures as well. A VERY nice nice dress! Thank you! Thank a lot, very beautiful. Love the idea of the two tiered, Thank you!! This is just the sort of dress I like to see - normal everyday clothing as compared with the unlikely wear espoused by most creators. Well done. I LOVE this dress!!! Thank you so much for making everyday clothing that is not sexed up! Love the waistband and layered gathered skirt on this. Very nice, thank you! AS we say in the US, Donna Reed is back. A very lovely dress Wendy. Thank you. I can so see this in the kitchen where dinner is getting ready for the man from the 50's. Oh my that is a pretty dress... Thank you! Thanks, glad you're still making clothes for G2F.